Promotion by Donze Communications (KSGM Radio). Contest rules stipulate that the baby must be born to Ste. Genevieve residents at the local hospital. Everly was actually the 4th baby of the year born at SGCMH. She and her parents, Bridgett and Brandon Pelfrey are from Bloomsdale. 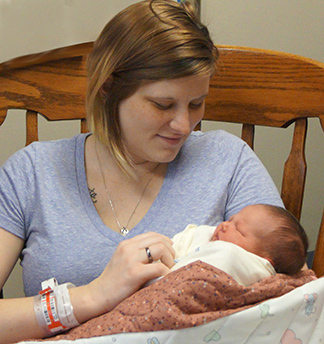 Everly was born on January 20 at 3:07 p.m. She weighed 7 pounds, two ounces and was 19 inches long. Dr. Racheal Whitaker was the delivering physician. She was welcomed home by big sister Alice (age 3) and big brother Travis, (age 2). Maternal grandparents are John and Christine Ellebracht of Bloomsdale. Paternal grandparents are Darsie and Dallen Rymer of Ste. Genevieve, and Christopher and Deonna Pelfrey of Kingman, AZ. Great grandmother is Barbara Jones of Kingman, AZ. Callier’s Sausage and Deli; the Show Me Shop; Missouri Alliance Mutual; Oberle Meats; Café Genevieve; American Family Insurance; Connie’s Buy the Bunch; Prism Hair and SGCMH Partners who presented the family with a beautiful hand-made baby quilt.